Kaworu Nagisa is a character from the Neon Genesis Evangelion series and related franchise media. He is primarily seen in the film that followed the series finale, and the two episodes preceding it. He is one of the Angels, but appears in human (child) form. His first appearance in a game was the Nintendo 64 game. 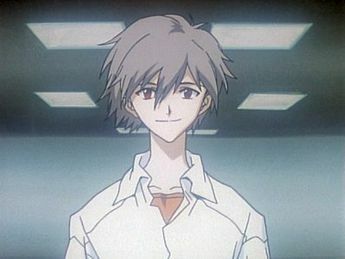 Kaworu’s sexuality is much debated in Evangelion fandom. In the show and even more so in the manga, he does seem to have a more-than-platonic interest in Shinji. If there is any definitive evidence of his sexuality, we have not yet found it. He is certainly a character who can be queerly read, however. This entry was posted in 1990s, Intertextual Reference, Queer Men, Queerly Read/Rumored on September 2, 2015 by Adrienne Shaw.